Congratulations! You survived the summer! While summer provides fresh fruits and vegetables and ample opportunity to be active, it is also known for flipping our calendars upside down. With vacations, late nights and no school, it can become difficult to maintain any routine, including wellness. Now that the calendar is back up marking all the soccer games and PTA meetings, it’s time to think about putting your health back on your schedule. Why would we want to schedule our wellness activities? Do you ever forget something if it is on your calendar? How often do you bail on any of your calendar obligations? 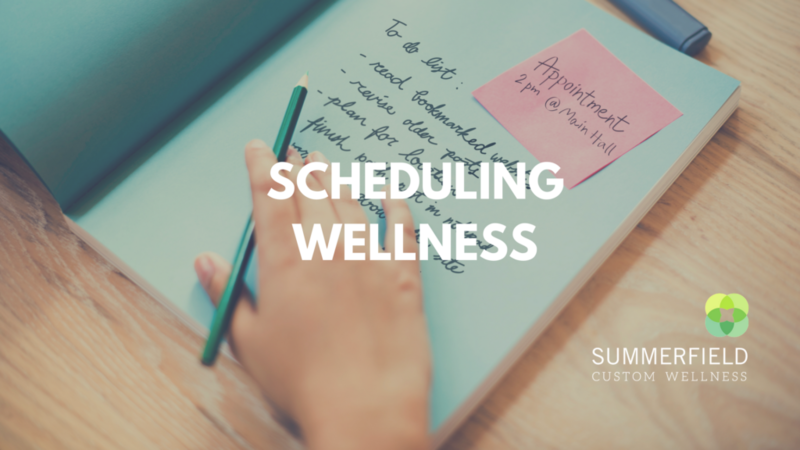 By scheduling wellness on the calendar, too, you identify it as a priority and ensure there is enough time for it. Determine how much discretionary time you have. We all use 24 hours every day. If you figure out where and how you are spending your time, you can find the best opportunities to schedule your wellness. You can download this time management exercise and watch the video for guidance. Determine your wellness activities. In an April article, we created your Optimal Health Vision. Go back and identify which adjustments you would like to make in your wellness routine. Do you want to start packing your lunch or batch cooking? Do you want to start exercising or meditating? Start by adding one wellness item to your schedule until it becomes a habit, then consider what to add next. Schedule your activities. If you want to exercise three days per week and you’re already using all 24 hours of Monday, Tuesday and Thursday, you get to let yourself off the hook on those days. No exercise and no guilt. However, if you skip your exercise on Wednesday, you leave yourself no choice but to exercise on Friday, Saturday and Sunday that week. Put it in your calendar and don’t forget any prep that goes along with it. Make sure you have clean workout clothes and comfy sneakers by the door so nothing can foil your plan. Plan for relapse. Inevitably, there will be a day or a week (or a few) where life truly forbids you to stick to your schedule. That’s normal. Unfortunately, it is actually abnormal to restart your routine on the other side of this hiccup. While you are scheduling these activities, I want you to also take a second to make a plan for relapse. If you get derailed, what will get you back in the groove? Make it something good so you have a personal incentive to get back to your routine. Consistency is your best friend when it comes to reaching your goals. Ask for help. This could come in many forms. Maybe you need an accountability partner like a friend or a spouse. If you feel there is too much stress or emotions sabotaging your goals, a mental health counselor may be able to help you break down those barriers. And if you need help with your health or nutrition, of course you can reach out to us. I always joke that we help people figure out why they do what they do and why they don’t do what they tell us they want to do. Let us help you sort it out! Remember that wellness gaps can come in various forms. Balanced nutrition, physical activity, stress reduction and sleep are all key aspects to your overall health. Finding the right variety of activities and then scheduling time for them will help you continue to move closer to your goals. Establishing a healthy schedule now will help make your wellness routine indestructible when the holidays come back around.